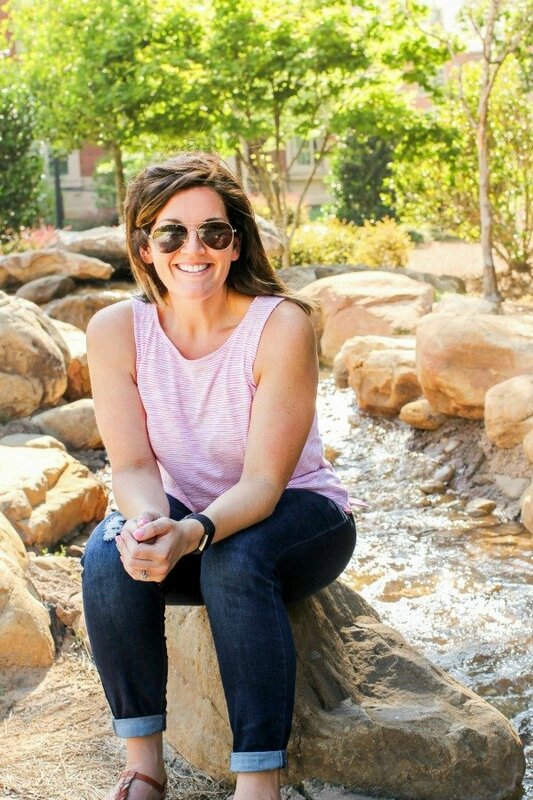 January 21, 2019 By Allyson 23 Comments This post may contain affiliate links. Read my disclosure policy. With the Big Game right around the corner, I am always trying to make better-for-you alternatives for snacks. 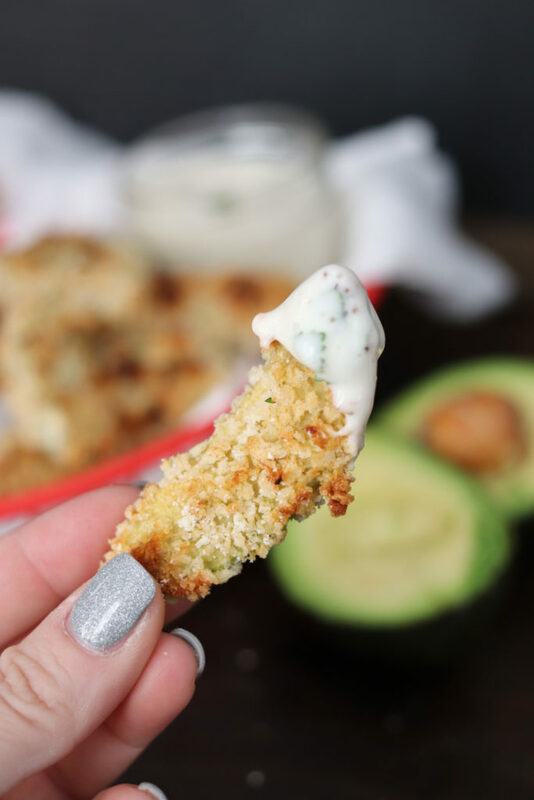 Making these baked avocado fries is easy; they only take a handful of ingredients, cook in 20 minutes, and are ultra-delicious! Today’s post is sponsored by ALDI, but all opinions are my own. I always head to ALDI for my game day foods and I suggest you do too! Shopping at Aldi makes life easier and more affordable as they offer high-quality food at affordable prices! I was able to pick up all of the ingredients needed for these Baked Avocado Fries at ALDI. fresh avocados, found in the produce section of ALDI. Cut the fresh ALDI avocados in half, then remove the pit. Cut into 4-5 thicker slices per half, and use a spoon to scrape the back of the skin to remove the avocado flesh. Setup an assembly line: shallow bowl with flour, shallow bowl with 1 egg (beaten) + 1 TBS water, shallow bowl with panko breadcrumbs + seasonings, and sliced avocados on a plate. Dredge the avocado carefully in flour, then dip it into the egg wash covering it completely. Let extra drip off, then toss into panko mixture, pressure mixture against avocado to coat. Repeat for all avocado slices. 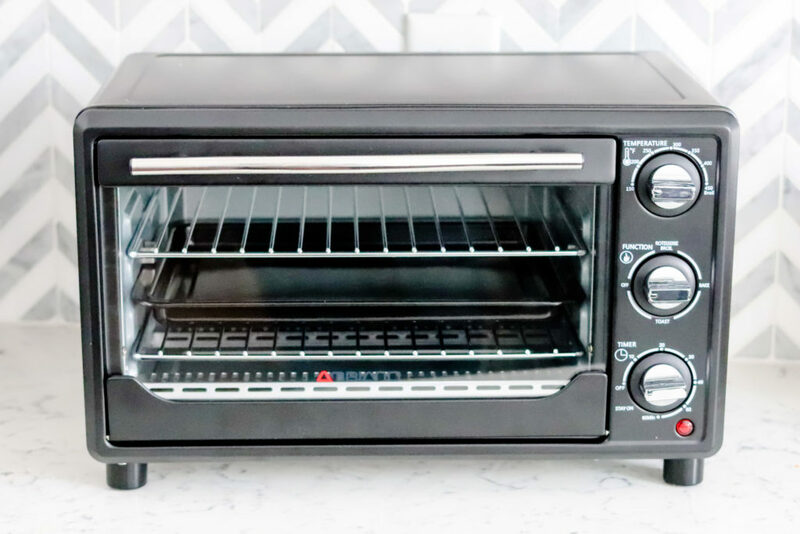 Using the Countertop Convection Oven from ALDI (available now for a limited time! ), remove the baking sheet and line with foil or parchment paper and spray with olive oil spray. Add the covered avocado fries to the baking sheet, and lightly spray the tops with olive oil spray. Set oven to 350 degrees, and set timer for 10 minutes. Place the baking tray into the oven. After 10 minutes, flip the baked avocado fries over, then cook 10 more minutes. Remove and top with chopped cilantro and sprinkle parmesan cheese. Serve with your favorite dipping sauce such as ranch, Zax Sauce, BIG MAC SAUCE, or Cilantro Lime Dip! Are you as big of a fan of ALDI as I am!??! I shop there all the time and love their low prices and quality brands. Did you know that their innovative approach has made them one of the fastest-growing retailers in the U.S. and a favorite among savvy shoppers (*According to annual surveys of U.S. consumers conducted from 2011 to 2017 by Market Force Information®)? It’s true! More than 90 percent of their store consists of ALDI-exclusive brands, and they guarantee the quality is as good as or better than name brands. They guarantee quality on all of their private-label products. If a customer doesn’t like an ALDI-exclusive product, they can bring it back, and ALDI will return their money and replace the product. ALDI was the first grocery store to offer all ALDI-exclusive products free of certified synthetic colors, partially hydrogenated oils (PHOs) and added MSG. I know, the stores are designed a little differently, but that is just so they can keep prices low and keep the store working efficiently. They display products right in their boxes, ask customers to deposit a quarter for a shopping cart (and you get the quarter back when you return the cart at the end of your shopping trip) and encourage people to bring reusable grocery bags! Not only can you find high quality food at ALDI, but you can also find new household products at low prices for a limited time through ALDI Finds. It’s a way ALDI surprises shoppers with trendy products, while they are able to test new items that could become part of their everyday selection. 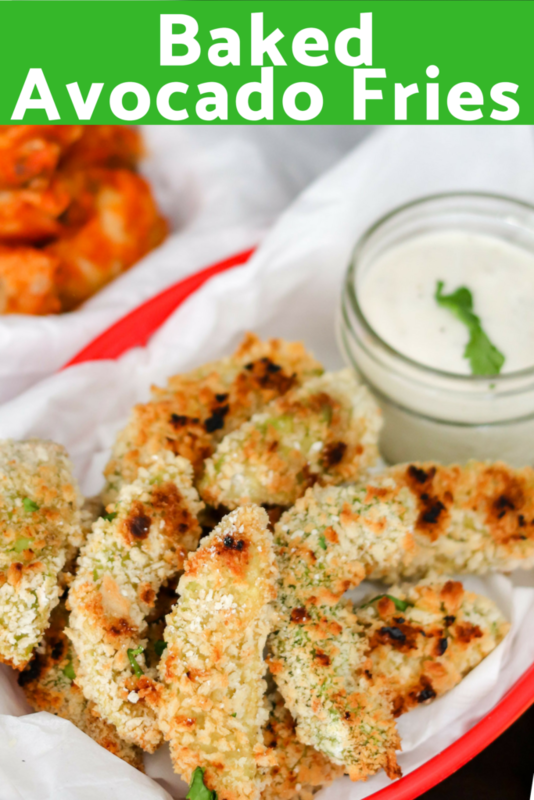 Right now, for a limited time, you can find the same awesome countertop convection oven I used to make these Baked Avocado Fries! I also used the oven to make some of our favorite Kirkwood Buffalo Chicken Wings to serve alongside the Baked Avocado Fries, which you can also find at ALDI. What are you making for the BIG GAME this year? I highly suggest heading to ALDI to pick up your GAME DAY ingredients and trying out these Baked Avocado Fries! 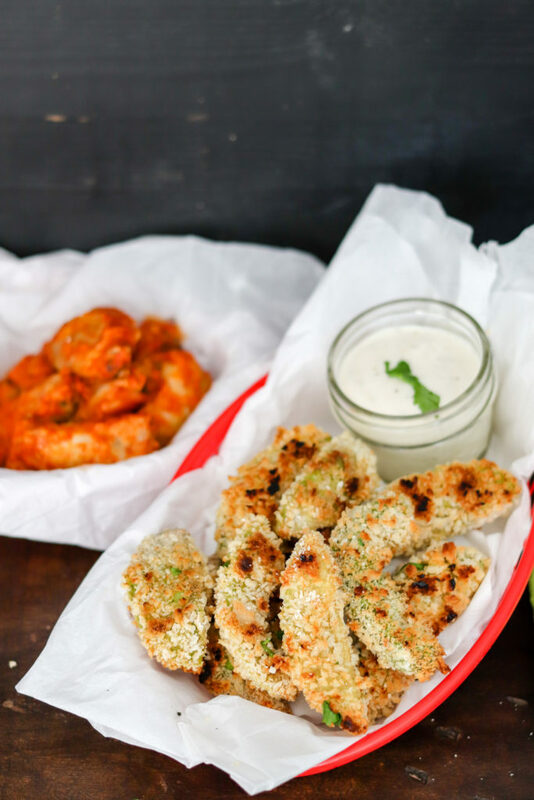 Want to make these Avocado fries in the AIR FRYER?? Check out the easy Air Fryer Avocado Fries recipe here! 2 medium ripe fresh avocados found in the produce section of ALDI. Setup an assembly line: place flour in a shallow bowl, add eggs +water to a shallow bowl and beat together, place panko breadcrumbs + seasonings in another shallow bowl, and sliced avocados on a plate. Dredge the avocado carefully in flour, then dip it into the egg wash covering it completely. Let extra egg wash drip off, then toss into panko mixture, pressure mixture against avocado to coat. Repeat for all avocado slices. Using the Countertop Convection Oven from ALDI set on bake at 350 degrees, remove the baking sheet and line with foil or parchment paper and spray with olive oil spray. Place the avocado fries on the baking sheet, and lightly spray the tops with olive oil spray. Set timer for 10 minutes. Place the baking tray into the oven. 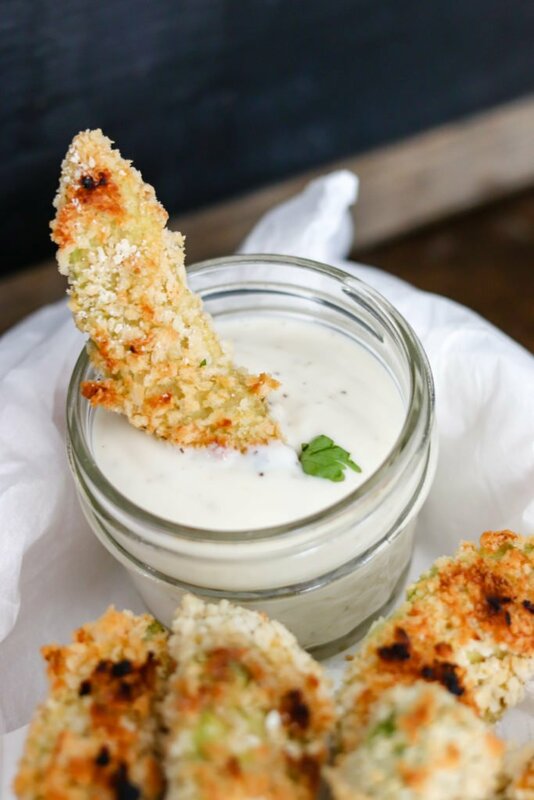 After 10 minutes, flip the baked avocado fries over, then cook 10 more minutes. Remove and top with chopped cilantro and sprinkle parmesan cheese. Serve with your favorite dipping sauce! I always love an alternative to potatoes! I can’t wait to make these. Definitely a great alternative to potatoes!!! I love all things avocado and these look incredible. Can’t wait to make them tonight! Yes they are so tasty! You will absolutely LOVE them! Avocados are my favorite! I seriously can’t wait to make them like this! I bet they are incredible with that nice crunch on them! You will love them!!!! They are soooo good! Now this is something I need to try! I love avocado! Avocados are where its at!!! I am thinking I need these fries in my life … stat!!! Yes!! They are definitely the best priced at ALDI, too! I eat BAKED AVOCADO FRIES every single day! Love the richness and creaminess of this wonder fruit 🙂 Had only savoury version before, but it was long time ago. These are so up my alley, I can’t wait to try them! wow, what a creative use of avocado, never seen this before. The baked avacado look absolutely delish!! Cannot wait to make these fries because I have a perfectly ripe avocado on my counter just calling my name! Thanks for sharing the recipe Allyson! These are game day eats for the win! Definitely a must make! Love this idea and need to try these ASAP! These sound delicious! Dangerously good. Oh yum! These are gorgeous! Love the way to change up a side to a burger. I have to give them a try! Omg…this looks amazing! Sending to my mom right now 😋 she would love this. And Aldi’s legit has the best produce hands down. I hope she likes it as much as we do! I have to agree that their produce is the BEST! You will totally enjoy these!